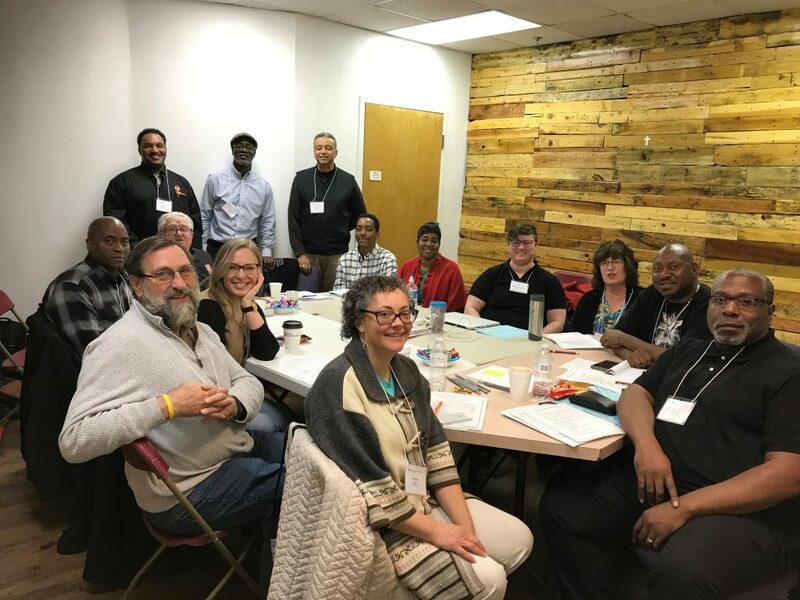 The Recovery and Reentry Cohort at the ELCA Congregational Vitality Training Event held in Las Vegas, February 6-8, 2019. Editor’s note: Sometimes ministry cohorts arrange to go off site as part of their experience at ELCA Congregational Vitality Training Events. The workshop described below took place during the training event held at Community Lutheran Church in Las Vegas, February 6-8, 2019. On Thursday, February 7, 2019, Pastor Dan Lund and Gary Nelson of the Church of the Damascus Road, Weatherford, Texas, joined Craig Whitney and me [Neil Bullock] for a workshop at Reformation Lutheran Church in Las Vegas. Craig and I represented Bethel Church, Chicago. We were invited by Lead Pastor Jason Adams. I was in contact with Pastor Adams about three weeks before the conference about conducting a workshop on Recovery and Reentry at Reformation. There was a small group from two congregations, Reformation and The Lakes Lutheran Church (also located in Las Vegas). I gave an introduction of the Recovery and Reentry Cohort and why we were in Las Vegas, and what we are hoping to do, going into the next Congregational Vitality Training Event, coming up in August 2019 in Baltimore, Md. Pastor Dan shared what the Church of the Damascus Road is doing in Texas with recovery-based Bible study. Gary Nelson shared his testimony of coming out of prison in 2017 and being welcomed by his Lutheran congregation in Texas and how he has started a recovery Bible study at his congregation as an extension of the Church of the Damascus Road. He shared how it has changed his life and his whole family. Craig Whitney shard his testimony of how he got connected to Bethel Church. He shared how Bethel welcomed him and gave him opportunities to get involved in the reentry ministry. Craig shared how important it is that he is able to be connected into the life of the congregation and not just attend worship. Craig serves on the church council at Bethel. He has recently finished his certification to become a drug and alcohol counselor with the State of Illinois. Craig is a case worker in Chicago at Breakthrough Urban Ministries, a community faith-based organization that offers services to returning citizens. The workshop was about two hours, and then we returned to the CV Training Event for the afternoon Recovery and Reentry Cohort training track.